Never Give Up: Pope Francis's Challenge: Is He Talking to Me? Pope Francis's Challenge: Is He Talking to Me? Pope Francis is challenging me in many ways. His preaching and witness strike me in a way that I cannot ignore. He doesn't make harsh demands, but he says and does things that challenge me to let my heart grow, and to become more aware of the concreteness of God's love in this world. For example: "Go out to the margins...." Thus he challenges the Church. He has demonstrated what this phrase means, by his actions. For years as a bishop, he has "gone out to the margins" by actually going to the slums, to the poor, to the drug rehab centers, to the victims of human trafficking, to the elderly and the sick and the cardboard shacks and the garbage pickers and the crack heads and all kinds of people who actually smell bad. Not to mention sinners and unbelievers. Its a stunning example. But what does it mean for me? How am I challenged by this? How am I supposed to respond to the Pope's call? My reaction to this is strangely defensive. I feel like saying, "Hey, man, I go to the margins plenty. What, am I supposed to go live with the poor? We live on the margins of spiritual and cultural poverty! I'm trying to raise my family in the Catholic faith, and educate my children and others to be able to resist the dictatorship of relativism. I'm not part of the self-satisfied, 'spiritually worldly' Church, no way! Those are the cafeteria Catholics, and they certainly need to be shaken up. But I'm doing plenty. I've given all my energy, broken my health, and still make material sacrifices every day for the sake of the teaching vocation that my wife and I share. I'm doing a lot. In fact, I'm 'the poor': how about somebody else coming out to take care of me? I'm always helping people; maybe they're not drug addicts but they have problems, and still... I'm the one who needs help! I'm still sick and crazy and exhausted. I'm barely hanging on, I'm definitely going to the margins, I'm doing enough, I'm... I'm... I'm... I... I... I!!!" JJ, stop it! *slap, slap* (metaphorically). You're overreacting, as usual. He's not talking to you! (the italics here is my Alter Ego responding; it may also be the reaction of some of my readers - if there are any who have actually read this far...) He's not talking to you! He's talking to those fat cats in the Roman Curia, and to all those bad people whose names are in the secret Vatileaks report! He's talking to those lazy bishops, and the Big Money people who don't care about the poor, and the Big Government people who don't care about the poor, and those theologians who do nothing but talk (and talk badly), and those people who think the Church is just an NGO, and all those other self satisfied bad people. Not you! This is about orthodoxy and caring for the poor. You've always been in favor of orthodoxy and caring for the poor. Now I'm thinking, "Hmmm. My Alter Ego has a point. I've always 'been in favor of' orthodoxy and caring for the poor. Of course I'm overreacting. I'm not like those bad people. I should say, 'Good for you, Pope Francis, you tell 'em,' because I agree with him. In fact, it will be fun to have a new way of judging people. Now I can say, 'Do these people go to the margins or are they just spiritually worldly and self satisfied?'" "I'm fine. I'm not challenged here. He's not talking to me. I don't have to change anything." Jesus said to his disciples, "Whoever does not take up the cross and follow me is not worthy of me. Those who find their life will lose it, and those who lose their life for my sake will find it" (Matthew 10:38-39). Jesus was talking to me here. Have I "lost my life for His sake"? Jesus said, "This is my commandment: that you love one another as I have loved you" (John 15:12). Do I love the way He loves? Maybe I need to think of this in a different way. We are all being challenged to "go out to the margins," although perhaps our "margins" are not the slums that surround the city of Buenos Aires. Each of us is called to a total love, to a complete giving away of ourselves. Many of us need to start "going out" in the very basic sense of actually paying attention to the persons God has given us in our lives. 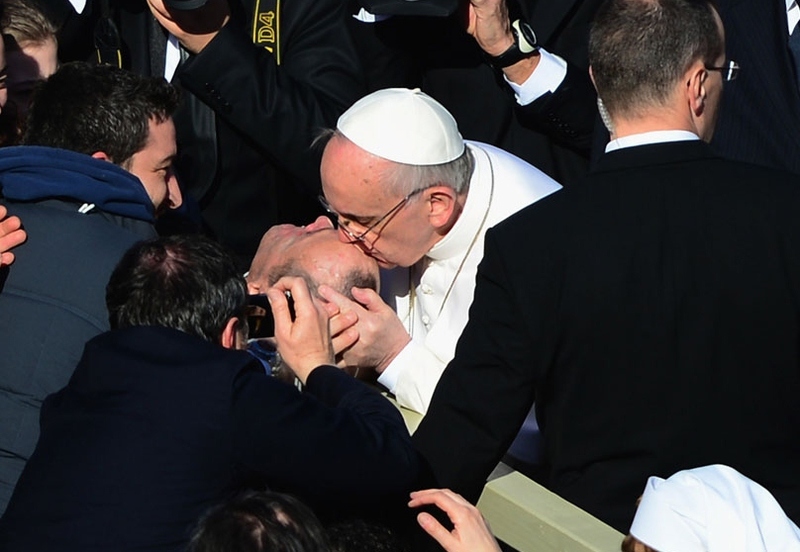 Pope Francis is continually reminding us that we must help each other, we must take care of each other. The fundamental "margin," for me, is my "self." In fact, I would go so far to say that I must first of all love myself, but that means loving my real self, not the egocentric whirlwind of chaotic appetites and self-obsession that I am always trying to protect. My real self exists in total dependence on God, in relation to God, in the image of God, and destined to share in the glory of God. "I" exist as a gift of Love and a vocation to love. The life of myself consists in loving. If I do not "go out" in love I get "sick" (as Pope Francis has also said). Eventually I die. Go out to the margins! God is at the margins, as my origin and my destiny, and in Jesus as the One who is present in my life and calls me to share in His Divine life. This presence and this call come through the human persons and the real circumstances of my life, and especially the gifts of grace given by Jesus in the Church, in the sacraments, in the path of a concrete vocation. "So I must love Jesus in the Church and in people" ... ah yes, but this not a package that I can just get and hold onto. Its a life that grows and changes, that is full of God's "surprises" (Pope Francis, again). If I am really following Christ and loving Him, I'm going to start noticing poverty. I will discover those who hunger for bread and also those who hunger to be treated like human beings, to know that they have value, that they are loved, that they are not alone. I cannot satisfy the ultimate hunger of any person, but I can help them and they can help me. We can care for each other and travel the road to our destiny together. Life doesn't happen unless we respond to reality. We must "go out" in response to the whole of the reality of our lives which is given to us by Jesus. We must pay attention to everything, all the way "to the margins," which many of us already know can mean a lot of personal risk. The margins are in our marriages and families, in our work and our suffering, in the needs of the community, in the challenge to see every human person as a brother or a sister, made in the image of God. If we love God, we will seek out and find the poor. We will find many things and we will have a great life, but we will never be satisfied! As long as we live, we will never be able to say, "Okay, that's it. I've loved enough." This mystery is in His hands. The Jesus we follow loved all the way to end, all the way to the Cross, bearing in Himself the poverty of each and all of us. We love Jesus Crucified (as Pope Francis has stressed from the start). We must never be "satisfied." We must keep going out to the margins with all we have, and keep giving our lives ...giving Jesus who has made us His own and who wants to give Himself to every person. He will lead us to the margins and the persons who need to encounter Him through us. We go out to the margins, and the margins keep getting bigger, because Love is beyond all our measure. Pope Francis to Youth: "Have a Great Soul!" Have You Been "Busted" By the Pope? Do We Worship the Lord? John Paul II: "Every Person Matters...Even You"